31 station zip line flight is great to fly through the jungle back and forth across the river if you keep your head about you and look upstream sometimes you can get a glimpse of a waterfall in the background. Most of the platforms are between 10 and 20 m above the ground. 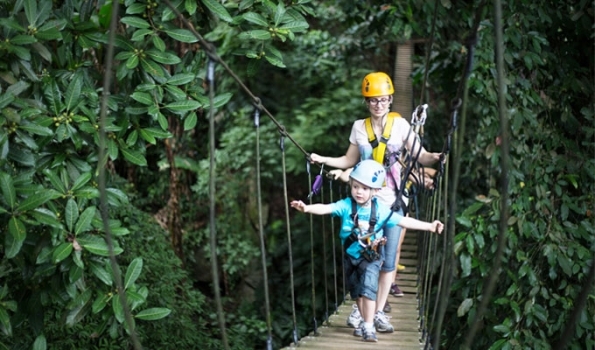 There is a 400 m zip as well which is one of the highlights and at one point when you’re going back and forth across the river you may be close to a hundred meters in the air. 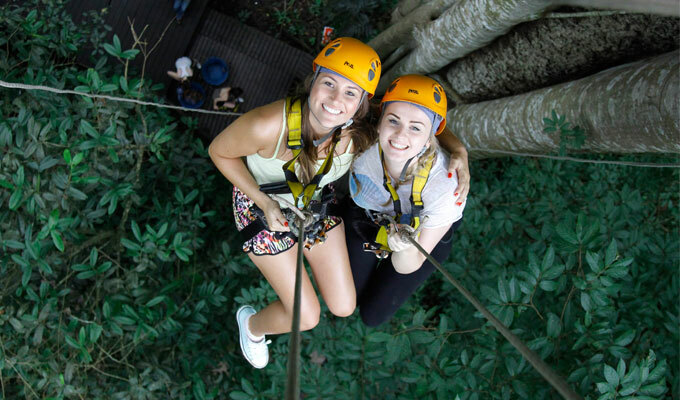 This canopy tour is a great way to see vistas in the jungle. If is fun and incredibly safe. 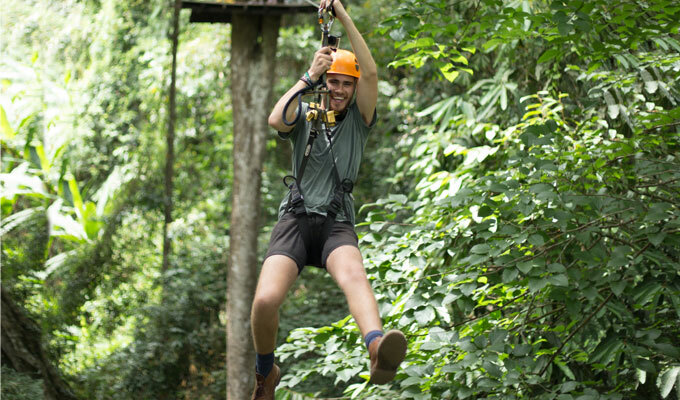 Please note that the Zipline has a weight limit of 100 kg or 220 LB. If you are a little over or just under this range let me know and we can advise you accordingly. There is also a strict age limit of 70 years. 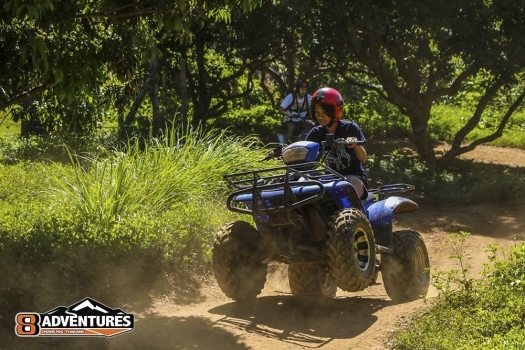 1.hour ATV trip is set up for beginners to intermediate drivers. We start out with detailed instructions and a training course to get you comfortable with your vehicles. 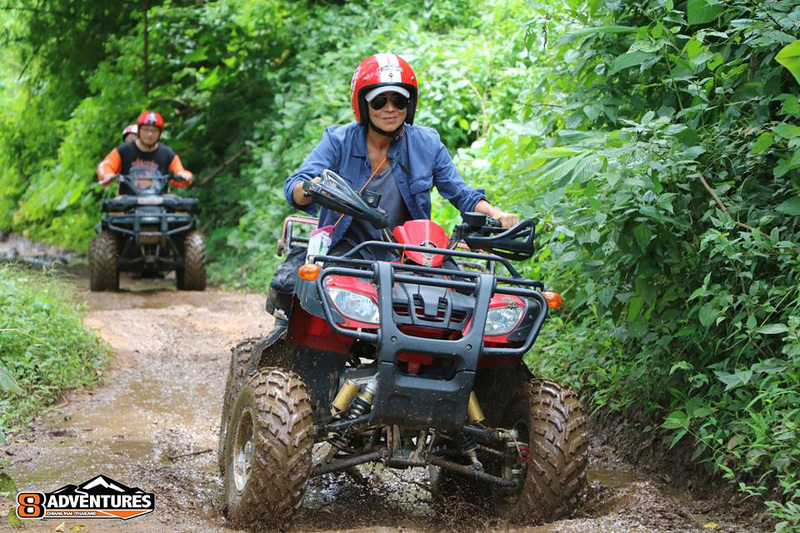 It covers a mix of road and off-road jungle terrain. It’s well-suited for those that would like to explore the local village and countryside in a different way. 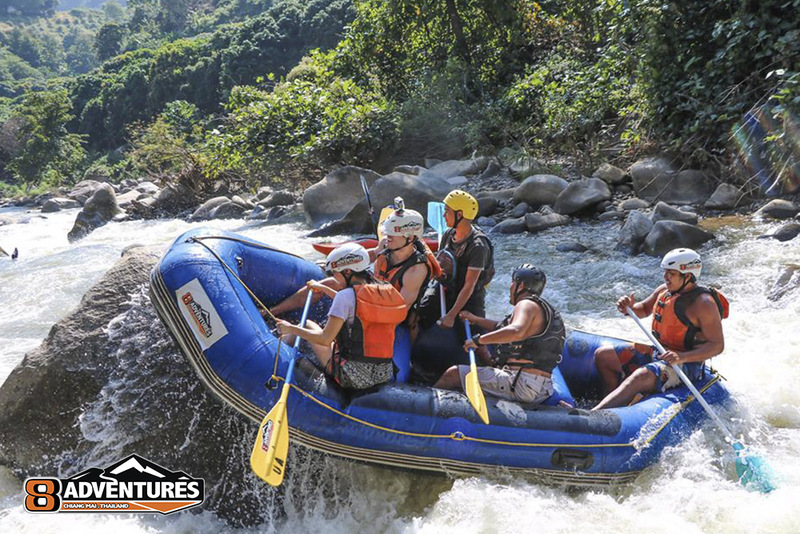 10 km White water rafting has it all. Is broken into 3 sections. 1st is a great warm-up where you learn skills practicing with the guides and getting used to the boat. This section has one class III and is probably the most beautiful section of the river with the encroaching jungle offering lots of shade. 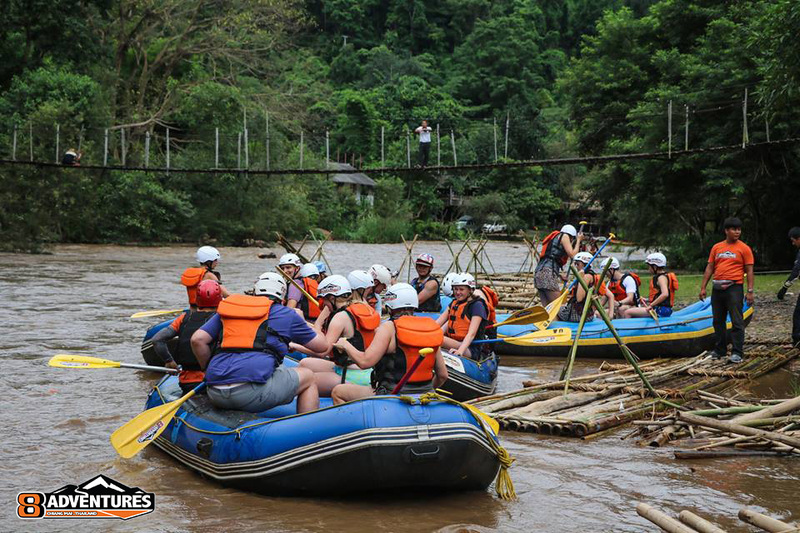 The middle section is an action-packed with rapids and is probably the best Whitewater in Thailand. Most of this section is class III and IV rapids. The 3rd section lets up in the beginning giving you some time to relax before entering a great class III and into short continuous section of rapids that goes almost all the way to the take out where our camp is. 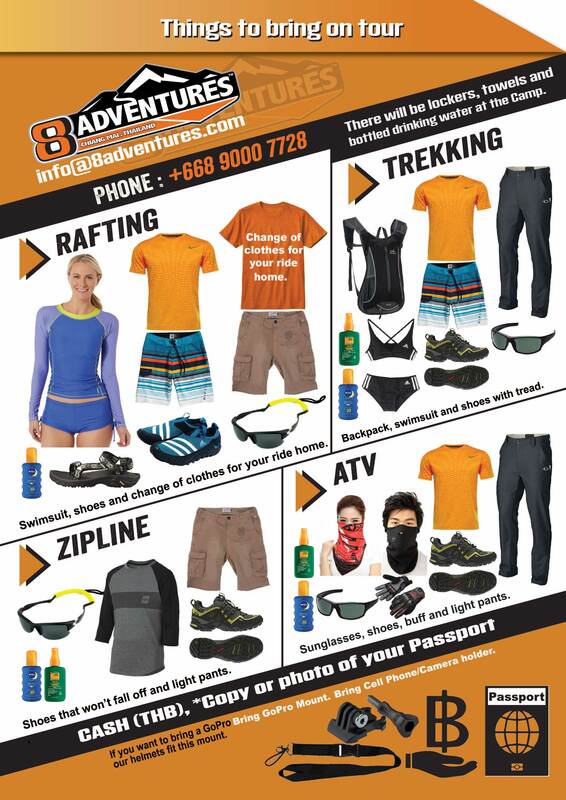 We have top-of-the-line equipment expert trained guides to make sure you have a safe adventure. We have towels for you when you finish and shower facilities that you can use before heading home. Make sure to bring a 2nd set of dry clothes so you can ride home dry. For children under 15 or as a choice for adults feeling apprehensive about the Whitewater we may ask them to go around the difficult section with the van. There is a road along this entire section. As you complete the 1st they would jump out of the boat and into the van where they can take a short trip downstream where they can join the rest of the group as they are finish the most difficult section. They will miss about 2 Km or river. This section of river changes dramatically with the amount of water in the river. Let us know if you can’t swim or have very young children will have a fun solution for you. During mid-February through May, we use inflatable kayaks. They are set up with one or two guests in front and a guide in the back. During the rest of the year we use varying sizes of rafts depending on water levels. 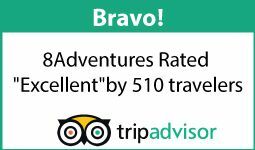 Check out our Facebook page for examples of past trips and what current trips look like. Please bring a copy or photocopy of your passport for registration. Bring a dry change of clothes for your ride home. We highly recommend that you bring sunglasses or glasses and we advise wearing shoes. 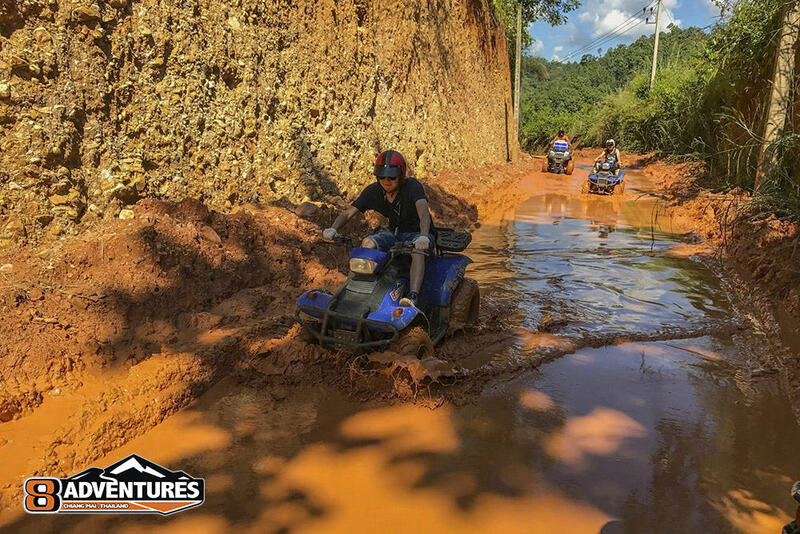 It is not a good idea to drive your ATV in sandals as there are sharp stones and rocks on the road. Likewise, in the event that you fall off it’s a great idea to protect your skin from scrapes by wearing trousers and a long sleeved T-Shirt. Sunscreen is also important and we recommend you bring a refillable water bottle and a change of dry clothes in the event that it’s raining. For Rafting and ATVs we have GoPro mounts on the top or the helmets. You must bring the slider attachment. For rafting if you can’t swim with it don’t bring it. We take no responsibility for lost GoPros or broken mounts or personal cameras of any kind.